The HP Pavilion dm1 netbook, first announced earlier this year, is now ready for a makeover as well as an internal upgrade, despite HP's shaky grounds on their PC business side. The 11.6-inch notebook will now be packed with either an AMD E-450 APU with integrated Radeon HD 6320 or AMD E-300 with integrated Radeon HD 6310, 4GB RAM, and at least a 320GB HDD. A separate model with a Sandy Bridge Core ix CPU will also be made available at a later date. Meanwhile, the chassis has been updated with a “soft-touch rubber” finishing and is a huge improvement over its predecessor, claims TechCrunch. The hinges will be more flushed with the notebook as well, so the unsightly bulge will be gone. 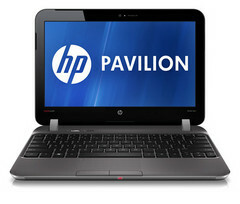 Beats Audio Technology is integrated, too, not unlike the recently reviewed HP 5330m. Overall, the notebook is expected to weigh 3.5 pounds (1.59kg) and come in at just under an inch thick. For comparison, the older dm1 sports an AMD E-350 APU with integrated Radeon 6310 graphics. The updated Pavilion dm1 should be available before the end of September for $400, while the Intel variant should be coming a month later for $600 with an external optical drive. 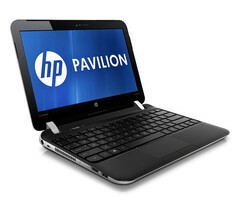 PALO ALTO, Calif., Sept. 8, 2011 – HP today introduced the updated HP Pavilion dm1, a consumer notebook PC featuring gloss or HP Soft-touch Imprint design, Beats AudioTM and HP Premier Experience – an exclusive set of innovations designed to improve on the Microsoft Windows® experience. Building upon HP’s MUSE design philosophy, the dm1 is the first notebook to feature HP Soft-touch Imprint technology, a unique printing process that creates a soft-to-the-touch surface by inlaying graphics into a rubber skin that covers the notebook exterior. The dm1 will be available in either a traditional charcoal gloss finish or a soft-touch ash black finish with a stylized pattern. The ash black design’s velvety finish not only provides a tactile experience, but also collects fewer fingerprints compared to gloss surfaces. With the addition of HP Beats Audio, a unique, high-performance technology developed by HP and Beats by Dr. DreTM, the Pavilion dm1 offers high-quality entertainment for mobile users. The dm1 features an 11.6-inch high-definition (HD)(2) LED display, and the built-in HP TrueVision HD(2) webcam captures high-quality images even in low-light conditions. ￼HP Premier Experience delivers a streamlined Windows experience that makes HP Pavilion notebooks cleaner, faster and more intuitive. Part of the HP Premier Experience, HP Launch Box allows applications to be better organized by grouping them for quick access on the Windows 7 taskbar. A simple mouse-over and click launches an application directly from the taskbar, freeing up screen real estate on the PC’s desktop. Including the dm1, HP Launch Box is available on 70 percent of consumer notebook models. Additionally, a simplified, organized Windows Start Menu allows users to find applications faster. With HP Premier Experience, consumer notebooks have quicker boot-up, shutdown, sleep and resume times, allowing users to access their content quickly. The dm1 shows an approximate 29 and 25 percent improvement on shutdown and resume times, respectively. Boot times and sleep times also are improved. — HP CoolSense technology uses advanced hardware and intelligent software to automatically adjust performance and internal fan settings for a noticeably cooler PC. Whether at a desk or on the move, HP CoolSense technology keeps the PC’s surface temperature at an optimum level of comfort. — HP ProtectSmart features a built-in accelerometer that detects when a PC is bumped or dropped, locking the hard drive into place within milliseconds to help protect important files. The feature’s safeguard modes run without interrupting day-to-day use. 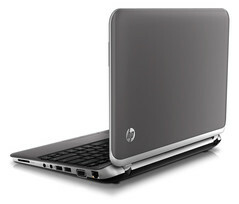 Elements of the HP Premier Experience are available today on 90 percent of HP’s consumer notebook models. available in charcoal on Sept. 21 with a starting price of $399.99. The soft-touch ash black model will be available this Fall. — The HP Pavilion dm1 with Intel processors is expected to be available in charcoal on Oct. 30 with an external optical drive included and a starting price of $599.99. The soft-touch ash black model will be available this Fall.